The SmartScope CNC 500 dimensional multi sensor measurement machine offers maximised productivity and quality as the best, large volume, general purpose optical metrology solution on the market. With the capacity for additional and multiple sensors and the option to configure expanded Y and/or Z travels to accommodate large parts or fixtures, the CNC 500 is guaranteed to become the most important asset within your manufacturing processes- optimising your product performance and profitability. 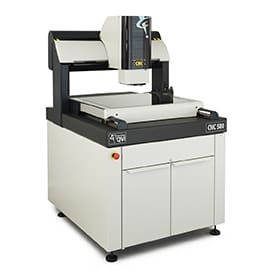 The CNC 500 combines all of the features present throughout the rest of the CNC range alongside superior performance from its large bridge-design system, precision mechanical bearing XYZ stages with DC servo motor drives as well as triple-axis joystick control, allowing for rapid, smooth part translation and robust measurement performance. Parts are able to move on the precision DC motor-driven Y-axis stage, where an extended travel is optional on both Y and Z axis, while the optics assembly travels in the X-axis across the stable bridge cross-member. As the number one choice for automatic general purpose multi sensor measurement operations, the CNC 500’s high quality, patented 12:1 AccuCentric® zoom lens automatically calibrates itself at every magnification change for complete and consistent measurement accuracy. Integrated exclusive OGP solid-state illumination technology offers the programmable power required to capture the most complex measurements with green LED profile, white TTL coaxial illuminators and even the patented programmable SmartRing™ LED illuminator are standard with SmartScope CNC 500. These, alongside a colour camera and the added option of advanced specialist software, ensure your video measuring system performance is optimal. It doesn’t end there, the CNC 500 is specifically designed to support a variety of multi sensors, including touch probes, Feather ProbeTM, laser sensors and Rainbow Probe™ scanning white light sensor. Multi sensor measurement systems combine optical, laser and tactile sensors, allowing for complete measurement of even the most complex components in a single system. Thus providing unlimited inspection capability and an extended measurement range within a smaller area. These are the SmartScope CNC 500’s top features but what are the benefits? Find out how plastic injection moulding and metal pressings specialists, R A Labone, and medical injection moulding company, Polymermedics, have benefitted from their CNC 500 multi sensor metrology systems.